The following introduction to CSS code-quality tools is an extract from Tiffany’s new book, CSS Master, 2nd Edition. Knowing which tools to use will help you ensure that your front end works well. In this article, we’ll delve into the browser-based developer tools for Chrome, Safari, Firefox, and Microsoft Edge. Most desktop browsers include an element inspector feature that you can use to troubleshoot your CSS. Start using this feature by right-clicking and selecting Inspect Element from the menu. Mac users can also inspect an element by clicking the element while pressing the Ctrl key. The image below indicates what you can expect to see in Firefox Developer Edition. In Firefox, Chrome and Safari you can also press Ctrl + Shift + I (Windows/Linux) or Cmd + Option + I (macOS) to open the developer tools panel. 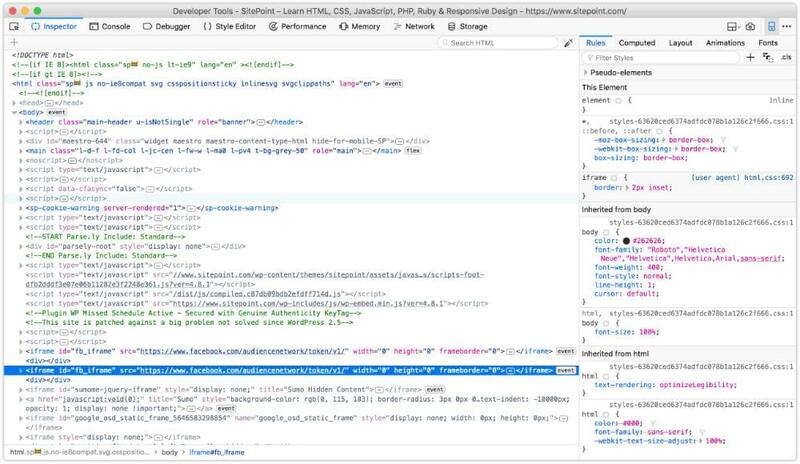 The image below shows the Chrome developer tools. 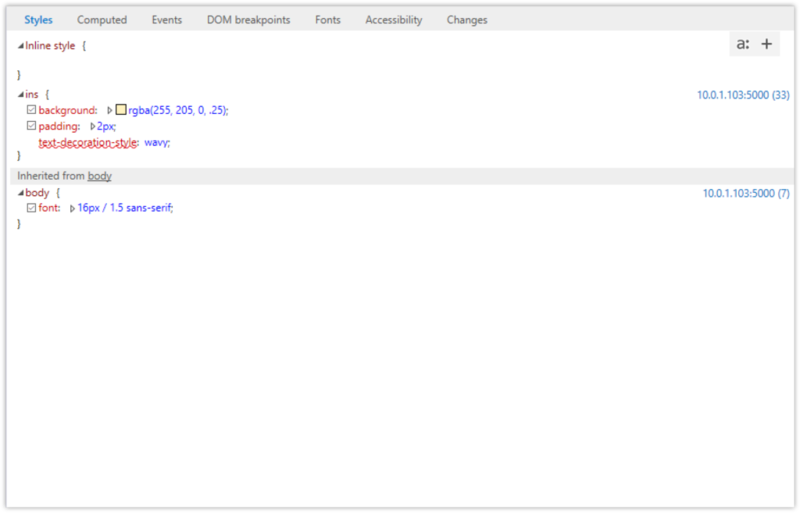 While in Microsoft Edge, open developer tools by pressing the F12 key, as seen in below. In Safari, you may have to enable the Develop menu first by going to Safari > Preferences… > Advanced and checking the box next to Show Develop menu in menu bar. The view for Safari developer tools is illustrated below. You’ll know you’re in the right place when you see HTML on one side of the panel, and CSS rules on the other. Sometimes an element isn’t styled as expected. Maybe a typographical change failed to take, or there’s less padding around a paragraph than you wanted. 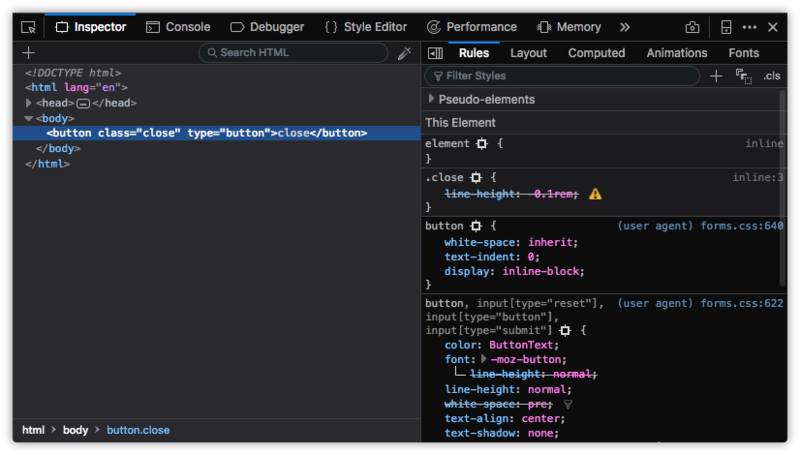 You can determine which rules are affecting an element by using the Styles panel of the Web Inspector. Browsers are fairly consistent in how they organize the Styles panel. Inline styles, if any, are typically listed first. These are styles set using the style attribute of HTML, whether by the CSS author or programmatically via scripting. 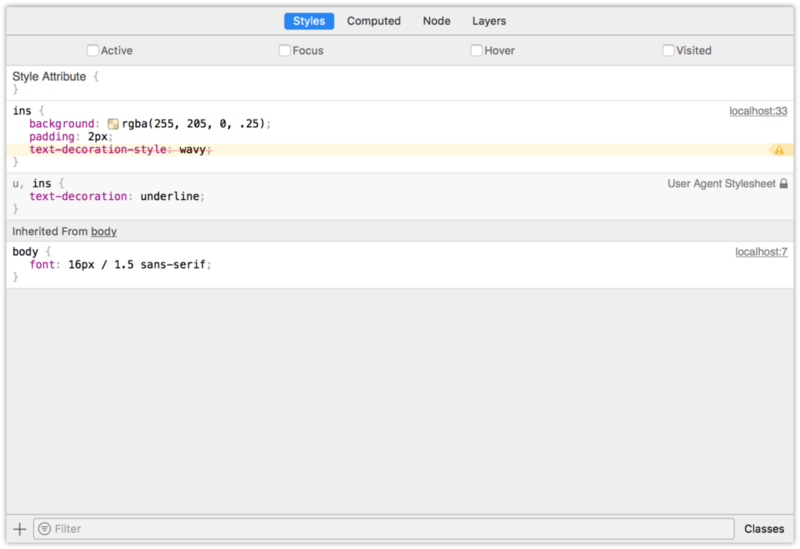 Inline styles are followed by a list of style rules applied via author stylesheets—those written by you or your colleagues. Styles in this list are grouped by media query and/or filename. Properties and values are grouped by selector. A checkbox sits next to each property, letting you toggle specific rules on and off. Clicking on a property or value allows you to change it, so you can avoid having to edit, save and reload. 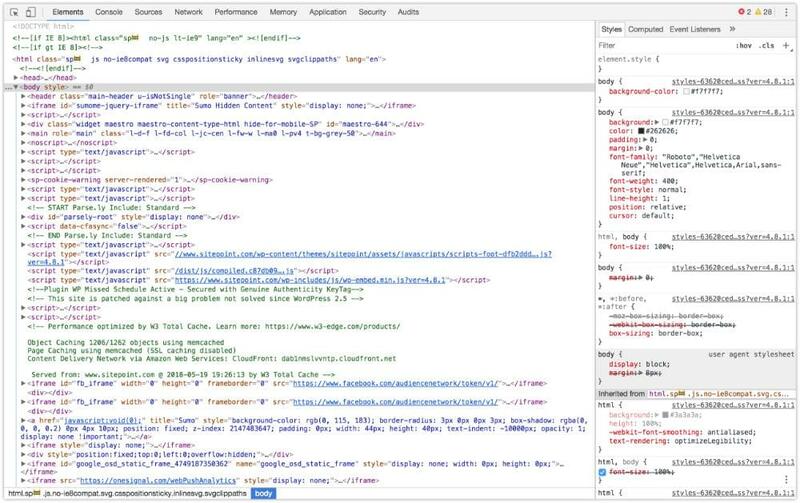 As you inspect styles, you may notice that some properties appear crossed out. These properties have been overridden either by a cascading rule, a conflicting rule, or a more specific selector, as depicted below. In the image above, the background, border, and font-size declarations of the [type=button] block are displayed with a line through them. These declarations were overridden by those in the .close block, which succeeds the [type=button] in our CSS. You can also use the element inspector to spot invalid or unsupported properties and property values. In Chromium-based browsers, invalid CSS rules both have a line through them and an adjacent warning icon, which can be seen below. Firefox also strikes through invalid or unsupported properties and values. Firefox Developer Edition also uses a warning icon, as shown below. Standard Firefox displays errors similarly, but doesn’t include the warning icon. In the screenshot below, Safari strikes through unsupported rules with a red line, and highlights them with a yellow background and warning icon. Microsoft Edge instead uses a wavy underline to indicate unsupported properties or values. When it comes to basic debugging and inheritance conflicts, whichever browser you choose doesn’t matter. Familiarize yourself with all of them, however, for those rare occasions when you need to diagnose a browser-specific issue. On-device testing is always best. 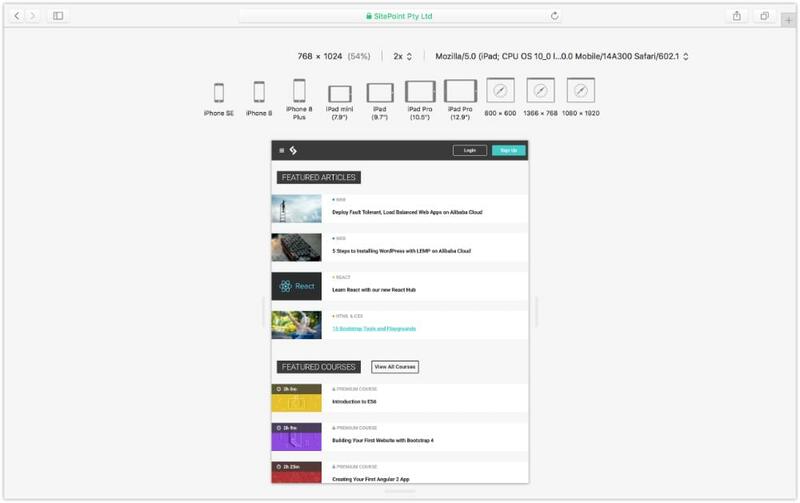 During development, however, it’s helpful to simulate mobile devices with your desktop browser. All major desktop browsers include a mode for responsive debugging. Chrome offers a device toolbar feature as part of its developer toolkit. To use it, click the device icon (pictured below) in the upper-left corner, next to the Select an element icon. Device mode lets you mimic several kinds of Android and iOS devices, including older devices such as the iPhone 5 and Galaxy S5. Device mode also includes a network throttling feature for approximating different network speeds, and the ability to simulate being offline. In Firefox, the equivalent mode is known as Responsive Design Mode. Its icon resembles early iPods. 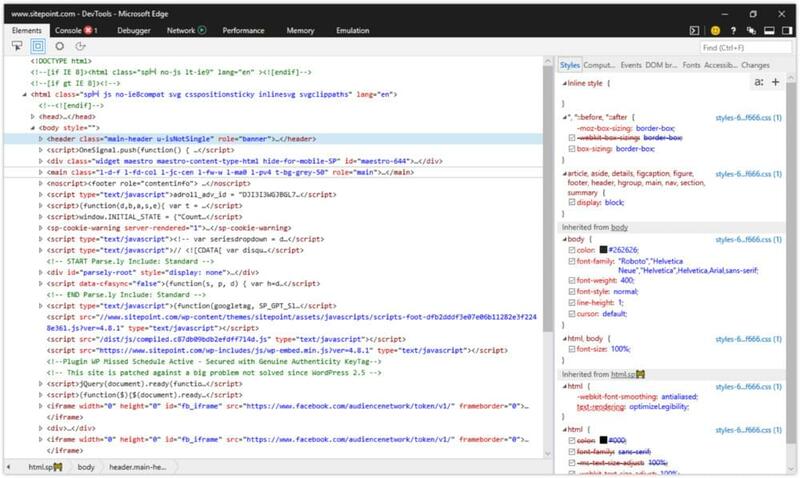 You’ll find it on the right side of the screen, in the developer tools panel, as shown below. In responsive mode, you can toggle between portrait and landscape orientations, simulate touch events, and capture screenshots. Like Chrome, Firefox also allows developers to simulate slow connections via throttling. 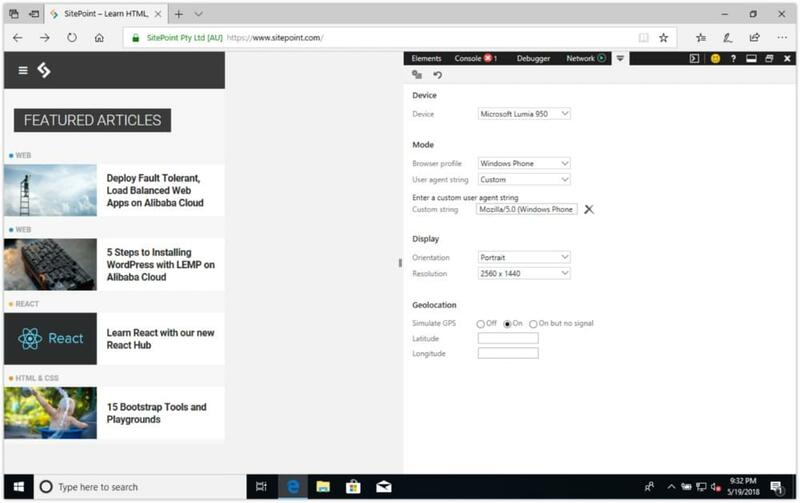 Microsoft Edge makes it possible to mimic Windows mobile devices—such as the Surface—with its Emulation tab. Select Windows Phone from the Browser profile menu, as shown below. In addition to mimicking orientation and resolution, emulation mode enables you to test geolocation features. However, you can’t use its emulation mode to simulate network conditions. 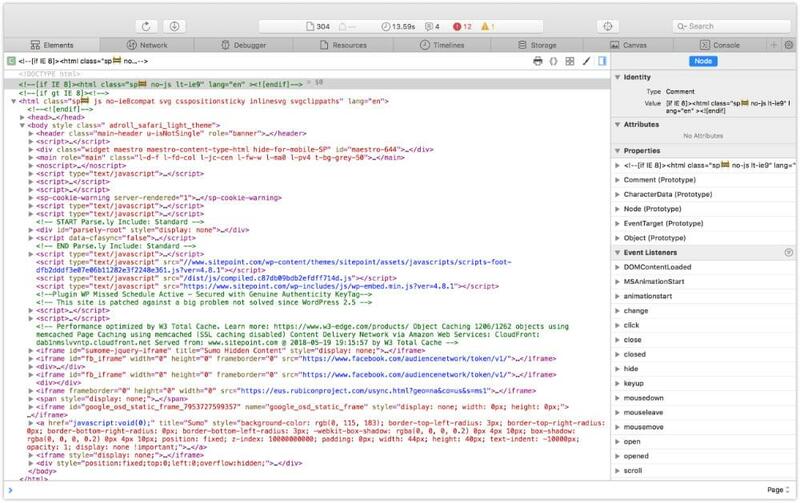 Safari’s Responsive Design Mode is in its developer toolkit. It’s similar to Emulation Mode in Firefox, but adds the ability to mimic iOS devices, as illustrated below. To enter Safari’s responsive design mode, select Develop > Enter Responsive Design Mode, or Cmd + Ctrl + R.
Tiffany’s book goes on to discuss debugging for UI responsiveness, covering reflows and repaints and other browser-based performance tools, such as working with each browser’s Timeline tool. To read more on CSS debugging and optimization, check out Tiffany’s book, CSS Master, 2nd Edition.